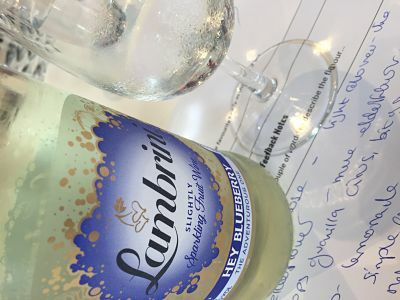 Lambrini taste test: Could I spot Hey Blueberry in a mystery line-up? 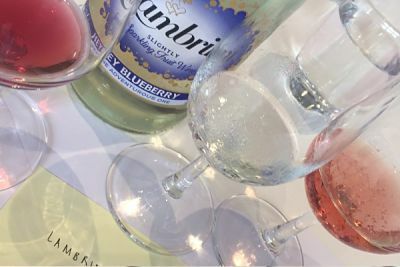 Lambrini taste test: Could I spot their new drink Hey Blueberry in a mystery line-up? I’ve just taken a Lambrini Taste Test. I was quite confdent as I was given a bottle of Lambrini when I left my job at Trinity Mirror. My Liverpool newsroom pals told me it was because I was an “Honorary Scouse Bird”. I was flattered and chuckled. What could go wrong? The other week I was in the wine aisle of a shop, just standing there, you know, looking, no intention of buying. I’m the wine aisle equivalent of someone who sits in a Ford Fiesta on a Sunday afternoon eating ice cream, staring out to sea, pointing out occasional things of interest to nobody in particular. A young lady walked past me several times, agitated, searching the shelves high and low. Perhaps she needed advice. As I steadied for the approach she exclaimed “oh, there!”, picked up a bottle of Lambrini and scurried away. I recounted this story when Lambrini invited me to taste test their latest drink, Hey Blueberry. No matter what you might think of Lambrini, this happily priced range of perry-based fruit drinks is a winner with many a girlie gathering. I had to spot the new drink in a blind tasting of three drinks. If I’d put my brain in gear first, done some homework and remembered that the name of the drink was Hey Blueberry (£3, 75cl, exclusive to Tesco) I might have fared better. All the drinks had a blueberry theme, but I didn’t spot blueberry in any of them – and I thought a blueberry-themed pink-coloured cider with lime was in fact the Lambrini. It was a bit of a #doh moment. I don’t know why you trust me (maybe you don’t). I checked my notes when the Lambrini was revealed. I’d described it like this: aromas – sherbert, elderflower, drops of vanilla, citrus, bit of stone fruit; flavours – lemonade, simple flavours, not long-lasting but refreshing. When I dipped in the glass again, after the event, then yes, I spotted the blueberry theme. When you know what you’re looking for you can find it. What did I think? Well as a simple refreshing light drink on a warm day it would be pretty nice, though I couldn’t drink more than a couple of glasses. I’d be happy to use it as the base of a sangria, tumbled into a jug with a bottle of cheerful rioja and lots of fresh fruit and ice.